Though they claim noble intentions, researchers at Germany's Fraunhofer Institute have created a disaster relief robot straight out of an H.R. Giger fever dream. The 'bot, which as far as I can tell is being referred to simply as "the spider," was developed to aid people in the event of a disaster. Say an earthquake collapses a building around you. The falling debris is a danger, yes, but equally hazardous are things like broken gas lines, and toxic chemical spills. That's where the spider comes in. Enviably agile and purposeful, the mobile robot makes its way through grounds rendered off-limits to humans as the result of a chemical accident. Depressions, ruts and other obstacles are no match for this eight-legged high-tech journeyman. Its mission: with a camera and measurement equipment on board, it will provide emergency responders with an image of the situation on the ground, along with any data about poisonous substances. Not an easy task; after all, it must be prevented from tipping over. But this risk seems a minor one as it confidently and reliably picks its way through the area. As a real spider would, it keeps four legs on the ground at all times while the other four turn and ready themselves for the next step. Along with swiping Mother Nature's design schematics, the researchers crafted the 'bot to be infinitely customizable. The machine's chassis and legs are fabricated via a standard 3D printing process and as a result, each individual element of the robot can be tweaked based on its upcoming mission. 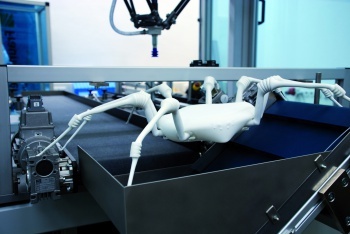 More crucially, this fabrication process allows for the 'bot to be replicated quickly and at low cost -- a boon for anyone who might need a whole army of terrifying arachnoid automatons at a moment's notice. I don't want to sound paranoid or needlessly alarmist -- and I think the idea to mimic a spider for disaster relief and exploratory purposes is brilliant in its simplicity -- but that machine looks like it just crawled out of the burning ruins of Ravenholm. Imagine yourself trapped and bleeding under a ton of collapsed concrete. What little light remains allows you to make out a bit of movement and you think to yourself, "finally I'll be rescued!" And then this thing comes skittering toward you. Speaking as a mammal with an evolutionarily-derived fear of all things eight-legged and spindly, I'd opt for "death by carbon monoxide inhalation" over whatever sort of web-based horrors this thing might unleash on my broken, easily cocooned form.